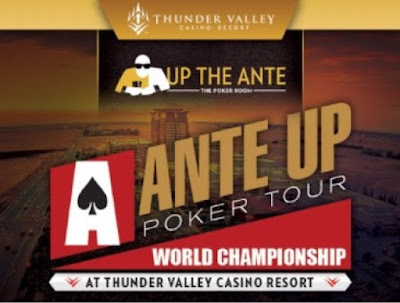 64 players are participating in the 2017 Ante Up worlds Head to head Championship, so be sure to buy in as soon as you can. The only head-to-head tournament at TVPokerRoom each year kicks off at 11am Thursday for the 64 entrants. 10am is the live drawing for first-round matches, so be sure to be here by that time to see who you're going to be up against. Players begin each match in this single-elimination, one-day event with 20,000 chips and play 20-minute levels heads up against one another. The final 8 players make the money, with the winner taking home $6,528. Four players won their way in to the tournament in a Wednesday satellite, so there's only 60 seats open for purchase, and a good number of those have already been bought. Buy in at the main poker room cashier now and play Head to Head on Thursday.